The six inches of snow this week motivated me to complete this winter card that I had started sometime last year. The papers I used are all from the Heartfelt Creations Snow Kissed Collection. 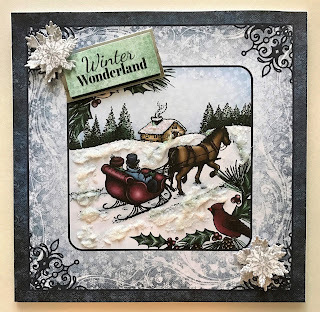 It is a 6 inch square card embellished with snowflakes that I stamped and layered. Glitter glue was used to add sparkle on the snowflakes and the house and Nuvo Glimmer Paste made the snow dimensional. I am hopeful that this is the last snow fall of the season. The only spring flowers I have right now are the paper ones I that I have created.